On Tuesday 18th October 2016, 9 year 6 children went to a fantastic leadership festival at Wantage Leisure Centre. Why We Enjoyed It: The leadership festival gave us the opportunity to be a sports leader like the leaders at King Alfred’s. 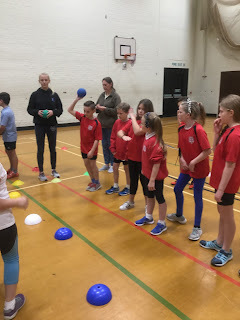 We also enjoyed this particular event because we did many sports activities such as: capture the flag, Ultimate Frisbee and we made up our own sports games for other schools to play. Everyone got to play who went to this incredible sports event. We had to make an action plan to take back to school, we planned to have more after school and before school clubs to give other children the opportunity to play a variety of sports. Our game was mostly thought by Alfie, however we all took part. We had a court split in halves and it was based on the game of bench ball. Stockham School tried our game and thought it was amazing.